Shutterfly thinks I just had a baby. 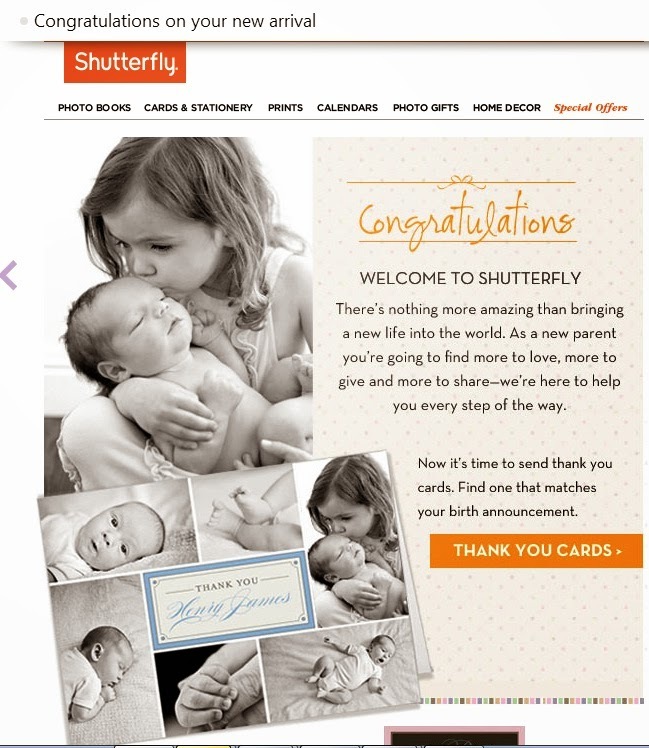 Shutterfly probably thinks you just had a baby, too, which might come as a surprise to you - especially if you’re male. The online photo developer sent out an email marketing campaign on Thursday, May 14, that went a bit awry. I was a little puzzled when I read my email. My first baby just turned 13, and my youngest baby is 7. Intended to go to Shutterfly account users who recently purchased baby-related items, the email went instead to what a company spokesperson told The Huffington Post was “a larger distribution.” Judging by the number of my friends and acquaintances and perfect strangers around the ‘net who received the email, that number was pretty large. Because it lets no opportunity for humiliation to pass by unnoticed, the Internet had a field day with the error, especially the platform of all that is snarky, Twitter. From all appearances, the email was an honest mistake. If it were about a generic subject, it might not have elicited the reaction it did. For couples struggling with infertility, however, the email was a knife to the heart. "After 3 miscarriages and no babies, this email ripped me apart." wrote one woman on Twitter. In response, Shutterfly sent another email later in the day apologizing to those who received the first message in error. 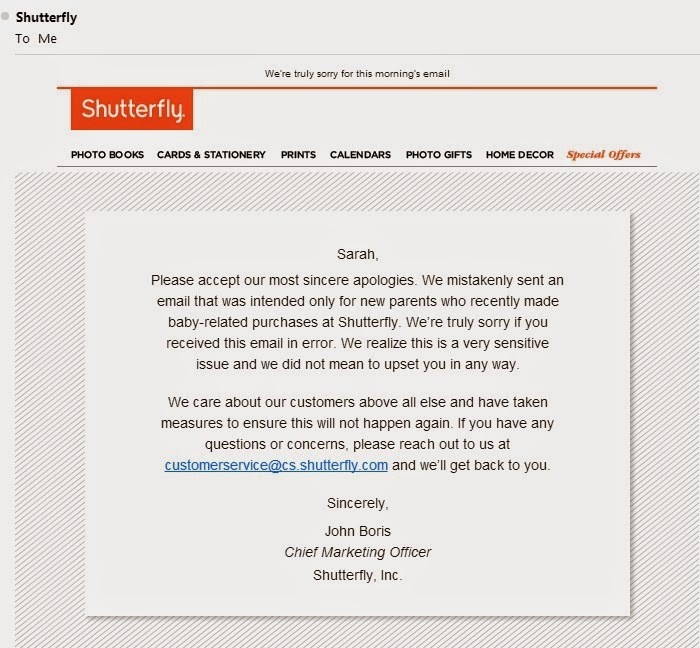 The Shutterfly incident offers a few takeaways on how to handle marketing and public relations fails. Pay attention to the reaction to the error so you can respond swiftly. Apologize when necessary, from the highest management level responsible. Distribute contact information (phone number, email address, etc.) so upset customers have a way to provide feedback. We've written extensively about crisis communications in prior posts, including Crisis Averted - Advice From the Pros and Crisis Communications for Nonprofits. Do you have any helpful tips for communicating during a crisis? Please share them in the comments. What will be your differentiator?